Lovely Coral/ Orange Striped Stretch Jumper New Size 10. Condition is New with tags. Dispatched with Royal Mail 2nd Class. Navy and white striped t-shirt with three quarter length sleeves. Can be worn as a shrug or lightweight jacket. Grey and white design. Ladies Punk Cotton Blend Thin Knit Junper 3/4 Sleeves Size M. Condition is Used. Not used much Nice condition Dispatched with Royal Mail 2nd Class. Lovely On Trend Oversized Cotton Jumper. STARS & STRIPES JUMPER. IT'S IN BEAUTIFUL SHADES OF BLUE, RED AND WHITE IN A STUNNING STARS & STRIPES DESIGN. IT HAS THREE QUARTER LENGTH SLEEVES, A ROUND NECKLINE AND TWO POCKETS. CREAM COLOUR COTTON KNITTED LACEY LOOK JUMPER SIZE 20. The length is 22ins and there is a button trim on one of the shoulders. The jumper is grey with Heart Breaker in silver sequins on the front. It as a crew neck & three quarter length sleeves. The jumper is used but is in excellent condition. SMALL AMOUNT OF BOBBLING TO THE FABRIC HERE AND THERE. SIZE IS 10. Mustard yellow sweater. Small 16- more like size 14. 85% cotton- feels nice and soft. 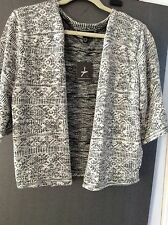 Bought to wear at work under brown jacket but never worn. 3/4 sleeve. pit to Pit- 19. Sleeve from shoulder seam - 17. CHEST (PIT TO PIT AND DOUBLED) 32"/81CM. LENGTH 22"/56CM. UNSTRETCHED SIZE. Size: 8 ( UK ) Eur 36. Length: 59 cm. The fabric is a cotton polyester blend. Style: Cardigan. Denim Jackets. Denim Waistcoats. Material: Cotton Polyester Blend. Main Colour: White. Size Guides. Pattern: Check. All sizes are stated in UK Ladies sizing. I can provide more pictures if necessary. SUMMERY ATMOSPHERE WHITE & RED STRIPE 3/4 SLEEVE COTTON CARDIGAN SIZE 10. Salmon pink jumper with open knit sections.